principals – Mr. E! The Motivator! presents Empowering Perspectives! Mr. E! The Motivator! posts a new motivational video for kids on YouTube! Posted on May 7, 2015 by Mr. E! The Motivator! Student Engagement Specialist, Mr. E! The Motivator! 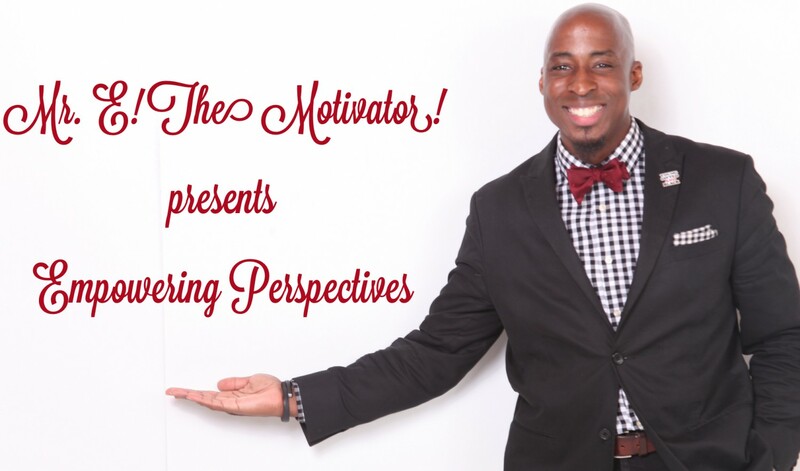 continues the push to inspire students across the nation with another YouTube video! Please enjoy and share with others! Posted on May 7, 2015 May 7, 2015 by Mr. E! The Motivator! Posted on April 2, 2015 April 2, 2015 by Mr. E! The Motivator! Posted on March 11, 2015 March 11, 2015 by Mr. E! The Motivator! Posted on February 6, 2015 February 6, 2015 by Mr. E! The Motivator! Posted on January 20, 2015 January 20, 2015 by Mr. E! The Motivator! Posted on January 11, 2015 January 11, 2015 by Mr. E! The Motivator! 9 Tips for Being More Disciplined! – Mr. E! Speaks! Ep. 2 In this episode of Mr. E! Speaks, I outline 9 great tips for being more disciplined. Being disciplined is a great skill that all successful people use to accomplish their wildest and most difficult goals. With these 9 tips, you will strengthen your self-discipline also! Enjoy! Posted on January 9, 2015 by Mr. E! The Motivator! Posted on January 8, 2015 January 8, 2015 by Mr. E! The Motivator!